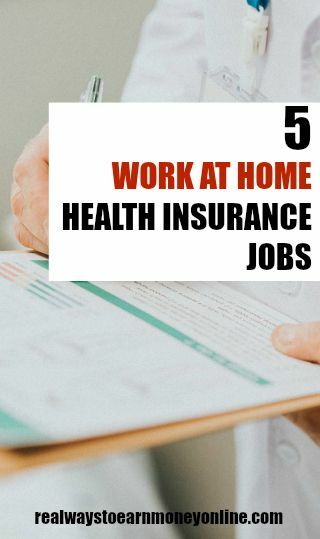 Today, I have some information for you about work at home health insurance jobs. In case you weren't aware, health insurance is one of the most profitable industries in the world, and like many other high-profit economic niches, it has quickly shifted with the growth of the internet to take advantage of the new technology in various ways. Recently, big-name insurance companies have gradually started to hire more remote workers to do jobs normally held by people in traditional office settings. In many cases, the remote jobs might pay less than you would get if you worked on-site, but the flexibility of working at home is an attractive perk which can sometimes make up for the lower wage, particularly if you're in a situation where working outside the home just isn't practical for some reason. The types of remote jobs on offer from insurance companies is incredibly varied, and different firms utilize home-based workers in totally unique ways. For instance, there are quite a few opportunities in this niche involving phone work – primarily in sales, and customer service. Other jobs offer unusual ways for people with healthcare training, such as nurses and physicians, to utilize their skills while operating out of their homes, either doing behind the scenes consultation, or working directly with clients in some capacity. With so much variety on offer in this industry, it would be a fool's errand to try boiling it down to a few simple job categories or make a basic list of skill-sets that might help you get hired. Probably the best thing to do is just check out a few different firms see if any of the positions look like a good fit for you in your current situation. Jobs like this tend to be a little sporadic, and many are location based. Some of the companies will go through big hiring waves, and then won't hire at all for a while, so check back often if you don't find anything that works for you the first time you look. This is one of the largest health insurance providers in the United States. A lot of their remote positions tend to be fairly high-end, requiring tons of experience and training. They even have remote managerial jobs, where you could be hired to oversee major departments, or coordinate with consultants in several different locations, developing business strategies. Obviously, jobs with such steep requirements will have great benefits and high pay, but they will also probably be out of reach for anyone who doesn't already have an impressive education or work history. Still, for those with the right background, there are some interesting opportunities on offer from this company, and their job listings would be well worth checking out. Go here to check for remote jobs with United Health Group. Another major insurance provider with many millions of clients all over the United States. They sometimes hire remote workers to handle basic office tasks like data entry, but many of their work at home jobs also have hefty experience or education requirements. One thing I noticed while browsing their listings were jobs for telephone RN consultants, which sounds like an interesting work at home opportunity for people with a background in nursing. Go here to check for work at home jobs at Humana. Health insurance isn't a primary product for this company, but they do sell liability insurance to doctors, so they're involved with the healthcare industry in different ways. Zurich's main products are home insurance, car insurance, and travel insurance. Their work at home job offerings include (among many others) claims adjuster positions, and openings for remote insurance attorneys. Go here to check for work at home jobs at Zurich. This is one of the biggest health insurance firms around. They've been in the business for a very long time, and have a huge number of clients. Compared to some other companies on this list, MetLife has a fairly small number of remote job openings, mostly for claims specialists and underwriters. But they do have quite a few sales positions for licensed insurance agents where you'll basically be starting your own small insurance business selling MetLife policies, which could technically be run out of your home. Go here to check for remote jobs at MetLife. They have quite a few different types of remote jobs available at all levels, from managerial to entry level positions. Apparently they also hire home-based nurses occasionally, but I couldn't find any openings for nurses at the time of this writing. The company's ordinary job search function seems to be kind of sketchy, and no matter which keywords I used, they kept showing results that weren't actually eligible for remote workers. After a bit of experimentation, I discovered that the best way to find work at home positions on this site is to go to the jobs search page and click on the advanced search link. That will take you to another page with a long list of different options, and at the bottom there's a remote work toggle. Go here to check for remote jobs at The Hartford. Hopefully the list above gave you some interesting ideas for jobs to check into. If you know of any other insurance companies with great remote job opportunities, or if you have some past experience doing this kind of work, please let us know in the comments section below. We'd love to hear what you think.